In the sprawling, densely populated capital city of South Korea, Lee Hye-young and her husband Kim Soon-kyo are nothing if not typical citizens. Which is to say, even the most mundane, everyday aspects of their lives are carried out at technology's leading edge. Consider their respective commutes to work early one recent morning. Lee clambers onto a city bus, headed to her office job in the southern part of the city. She pays using her radio-frequency-identification (RFID) card  it has a computer chip in it  part of a transit program conceived and implemented by the city government. The card is smart enough to calculate the distance she travels on any form of public transit, which determines the fare. She can then use the same card to pay for the taxi she hails to finish her journey to work. Sometimes her husband, the deputy marketing manager at a small chemical company, drives her to work. But not today. A few months ago, he applied online to join a program offered by the city that promises insurance discounts, reduced-cost parking and a tax break if he leaves his car home one business day a week. The city sent him an RFID tag, which he attaches to the windshield so the city can monitor compliance. It took him just minutes to fill out the application on his home computer, and now, he says, he saves the equivalent of $50 a month. From the city's standpoint, the estimated 10,000 fewer cars on the road each day means less congestion and less air pollution in one of the busiest cities in East Asia. For a decade, Seoul has had the justifiable reputation of being one of the most wired cities in the world. 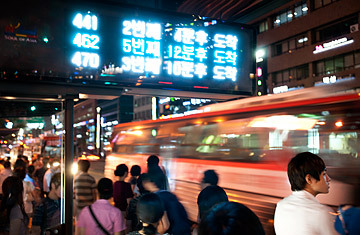 After the Asian financial crisis devastated the South Korean economy in 1997, the Seoul city government, the national government and the private sector all made a concerted effort to move the country's economy from one reliant on heavy industry to one that included information technology  a shift that by most measures has been a resounding success. Today, according to data compiled by Strategy Analytics, a U.S.-based technology market-research firm, an astonishing 95% of households in South Korea have a broadband connection. (Tiny Singapore is second, at 88%, and the U.S. comes in at No. 20, with just 60% hooked to broadband.) The entire city of Seoul, whose metro-area population is more than 20 million, is already one giant hot spot, with wireless access available from virtually anywhere within city limits for a small fee. That level of connectedness, either via high-speed cable or through the ether, has not only transformed South Korea's economy; it has changed forever the way this massive city is governed, how individuals receive services and interact with city hall and how prospective contractors solicit business with the city.